This is our 3rd longer princess cruise and now qualify for “ruby “ (30 sea days or more) these ranks would be fine if they gave discounts for drinks, WiFi, laundry,etc. I think you get free laundry and WiFi if you go up to platinum! Our Australia cruise started with 3 days at the Amora Hotel in Sydney... a very nice, quiet room in the convenient part of a large town. Even in our 60’s we opted for the bridge climb.. which was scary and fun! (Do the short one). We were told to embark on the majestic at a specific time based on your room floor.....ours was 4:pm. I have to admit... that is the fastest we ever got on a ship! The first sea day went quickly with the many new events to explore. We signed up for the you yang sanctuary in Melbourne our next port. Warning, this turned to be not what the description said... very difficult to see any kangaroos or koala! This tour would have been better if it was described as a sightseeing tour with a possibility of animal sightings! Our guide was good describing the area as we drove by. Another sea day... the Tasmania.... and Bonorong.... wow happy days!!! 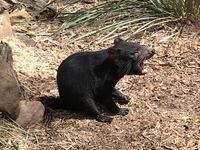 A tour with kangaroos, koalas and even dare devils!! !two more sea days... the the Fiordland and incredible scenery .....Dunedin,the next port was hilly and interesting. We toured and went to the batanical gardens.. also olverton house.. great if your into history and antiques in New Zealand! Akaroa, the next port.. was a hop in hop off... with a great driver who knew the area. We took the bike ride tour in Rotorua.. a super place inside a semi active volcanic area... with steaming geysers! Our trip ended in the Auckland hotel also a Amora... very nice hotel! We took another hop on hop off tour. Disembarking was long and painful from the ship and you wait for up to two hours to be called for port clearance! Eating on the ship for dining.... don’t get a set table number... if you want to meet people and have fun, ask for open dining or any time dining when you first book your cruise! Our room Stuart was so so ... he did his job, but not friendly like they usually are! The cabin was fine.... nice closet space... small balcony.. but mostly quiet and convenient. This is our 3rd longer princess cruise and now qualify for “ruby “ (30 sea days or more) these ranks would be fine if they gave discounts for drinks, WiFi, laundry,etc. I think you get free laundry and WiFi if you go up to platinum! Our Australia cruise started with 3 days at the Amora Hotel in Sydney... a very nice, quiet room in the convenient part of a large town. Even in our 60’s we opted for the bridge climb.. which was scary and fun! (Do the short one). We were told to embark on the majestic at a specific time based on your room floor.....ours was 4:pm. I have to admit... that is the fastest we ever got on a ship! The first sea day went quickly with the many new events to explore. We signed up for the you yang sanctuary in Melbourne our next port. Warning, this turned to be not what the description said... very difficult to see any kangaroos or koala! This tour would have been better if it was described as a sightseeing tour with a possibility of animal sightings! Our guide was good describing the area as we drove by. Another sea day... the Tasmania.... and Bonorong.... wow happy days!!! A tour with kangaroos, koalas and even dare devils!! 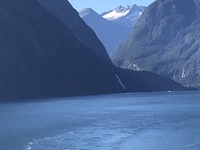 !two more sea days... the the Fiordland and incredible scenery .....Dunedin,the next port was hilly and interesting. We toured and went to the batanical gardens.. also olverton house.. great if your into history and antiques in New Zealand! Akaroa, the next port.. was a hop in hop off... with a great driver who knew the area. 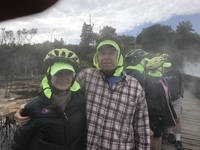 We took the bike ride tour in Rotorua.. a super place inside a semi active volcanic area... with steaming geysers! Our trip ended in the Auckland hotel also a Amora... very nice hotel! We took another hop on hop off tour. Disembarking was long and painful from the ship and you wait for up to two hours to be called for port clearance! Eating on the ship for dining.... don’t get a set table number... if you want to meet people and have fun, ask for open dining or any time dining when you first book your cruise! Our room Stuart was so so ... he did his job, but not friendly like they usually are! The cabin was fine.... nice closet space... small balcony.. but mostly quiet and convenient. Nice and convenient. Nice size closet... great room view to see the fiords!! !